The Reva – you either love it or hate it. But I love the sheer audacity of a little known group entering into the specialised big bucks world of the automobile industry. And the product is entirely offbeat. An all electric car. Plug it to a power socket every night for a 80 kilometre drive the next morning. Made right, this could be India’s answer to its burgeoning oil bills. And a blessing to the many millions that ride two wheelers mostly because it is all they can afford and not because they love the feel of the (polluted) wind on their face. And the small size is well suited to city driving. But the hitch is the big mismatch between price and product. For Rs 2,75,000 or USD 6,500 there are a clutch of vehicles from established companies that offer much greater driving and riding comfort. Not to mention the security of buying a vehicle from a reputed manufacturer with a global reputation. 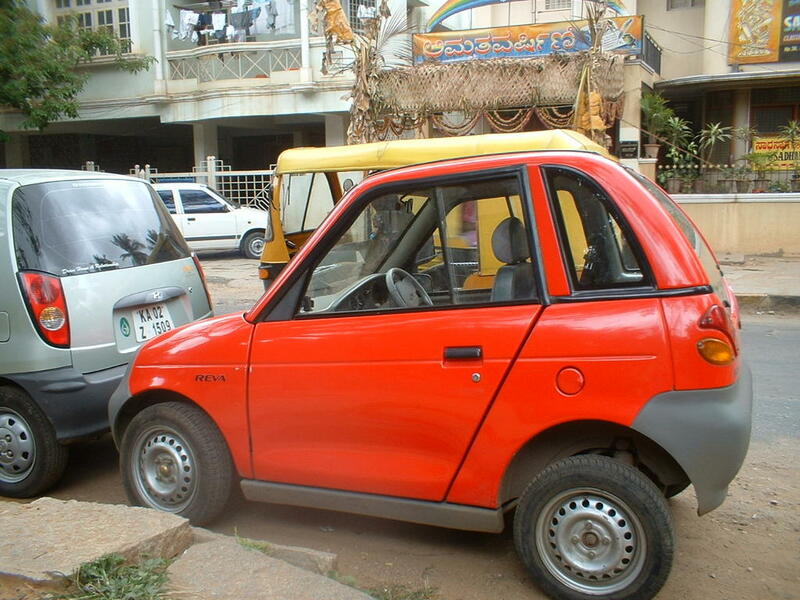 And so it’s unlikely that in its present avatar, the Reva will ever become popular or ever come close to being a mainstream vehicle. The only advantage the Reva offers is that its running costs are extremely attractive, A pittance compared to the running costs of petrol driven cars in a world where one litre of petrol costs more than a dollar, where bumper to bumper traffic ensures you consume much more petrol than you like to think about and where narrow congested roads force new one- way rules which increase the commuting distance. Even so, I am not sure how long the Reva will last. It’s a great concept and I would really like to see this ‘David’ win. I wish the Government creates the necessary conditions to make electric or hybrid cars more popular. Reduce import duties, offer more concessions to manufacturers so that they offer their hybrid variants in India. Toyota has the Prius; Honda the Civic, Accord and Insight. India can probably offers volumes that might make hybrids or cars that run on alternate energy viable. This might result in a win-win situation for all – on a micro level ease the burden on the user’s purse and on a macro level benefit the environment and the Indian Government’s oil bills. I love the sheer audacity of a little known group entering into the specialised big bucks world of the automobile industry. Absolutely. It's amazing that the company is still srviving after ten years of its inception. If the company cources are to be believed, Reva is world's best selling electiric car. Apparently it's been a small success in the UK as well (sold over 300 cars in an year). Their next generation Reva-NXG concept car's was in the news recently and for the right reason...it comes with some striking specs for an electric car-- a maximum speed of 120km/hr and range of 200km in one charge!! Unfotunately, with looks like those, I can't imagine driving it on the city roads. Why did they have to change Reva's classic shape? I wonder where did Dilip Chaberia invest those "25,000 to 30,000 man-hours" that he says he spent on designing the car. I also agree that for a two seater car, it needs to be priced right. Even with fuel efficiency like that. THAT is a small car! With the savings you make on fuel everyday and fuel prices surging everyday, it makes sense to go electric.